I love how God refers to us as trees many times throughout the bible. We want to be like those trees that stay green and never stop producing fruit, but sometimes it seems like we are in a time of drought. I was looking at the different colors of leaves and thinking about how they symbolize the various seasons we go through in our lives. As summer ends and autumn comes, the days get shorter and shorter. This is how the trees “know” to begin getting ready for winter. During winter, there is not enough light or water for photosynthesis. The trees will rest, and live off the food they stored during the summer. They begin to shut down their food-making factories. The green chlorophyll disappears from the leaves. As the bright green fades away, we begin to see yellow and orange colors. Small amounts of these colors have been in the leaves all along. We just can’t see them in the summer, because they are covered up by the green chlorophyll. The yellow leaves remind me of when I am fearful. Just like those trees, my “yellow” starts to show when I am not getting enough light and water from prayer and God’s word. Those magnificent, bright orange leaves remind me of His glory. 1 Chronicles 16:32-34 32 Let the sea roar, and all its fullness; Let the field rejoice, and all that is in it. It is so cool how all of creation (everything He made) will rejoice before the Lord! Just like those orange leaves, it is so wonderful when we can display His glory for others to see. We are human and don’t always do a great job of displaying the glory, but we can give it our best shot. How? We can admit and apologize to others when we are wrong. Lay down our right to be right when it really doesn’t matter anymore. Don’t hold others in unhealthy expectations, forgive quickly, etc. The bright reds and purples we see in leaves are made mostly in the fall. 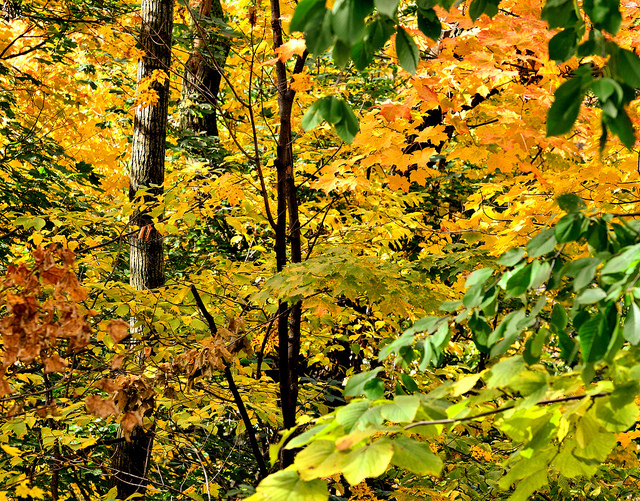 In some trees, like maples, glucose is trapped in the leaves after photosynthesis stops. Sunlight and the cool nights of autumn cause the leaves to turn this glucose into a red color. To me the red leaves symbolize the times when I am going through a fiery trial. My trial may be on display for everyone to see or I may be enduring something that only my closest friends know about. In either circumstance, I know if I am walking through it with God, it will reflect beauty in my life, just like that magnificent fire-red tree reflects the beauty of His creation. How about those dried up brown leaves? They speak for themselves. Those leaves are no longer useful to the tree and they dry up and fall off. Anything that is no longer useful for the Kingdom needs to be drying up and falling off of us. All of us will go through seasons where, just like the trees, we will be in a “Winter”, wilderness or resting place where we will need to feed or rely on what we have stored up. During those times it is crucial to allow the Holy Spirit to dry up and remove whatever needs to be blown off of your tree of life. It will cause you to produce greater fruit when you begin to bud and bloom again. As I stood looking at the beauty of those trees that day, I will so aware of His presence and glory in creation. Where do you see His glory displayed today?